I have been in the garment decorating industry since 1999, and have worked with many small businesses to help them make money and improve their marketing and sales. I love helping small businesses as I have been involved with or had my own small business since I was a teenager. In my free time, I enjoy volleyball, bowling and spending time with my sons. I have lived in St. Louis since 2010 by way of Boston, Colorado Springs and most major cities in Arizona. Aaron also delivers a bi-weekly Podcast called "2 Regular Guys" with industry friend Terry Combs. You can catch it at 2 Regular Guys. 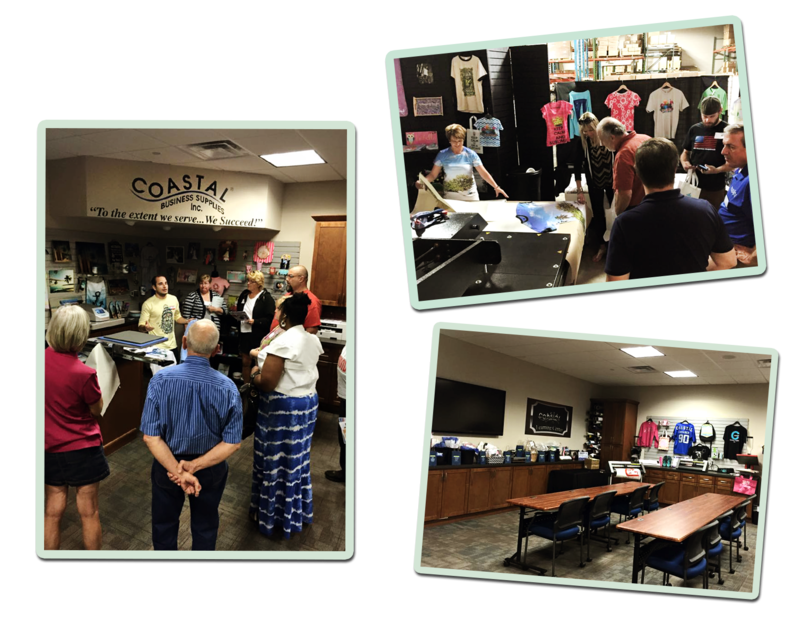 Coastal Business’ 25th Anniversary Open House Was A Great Success! 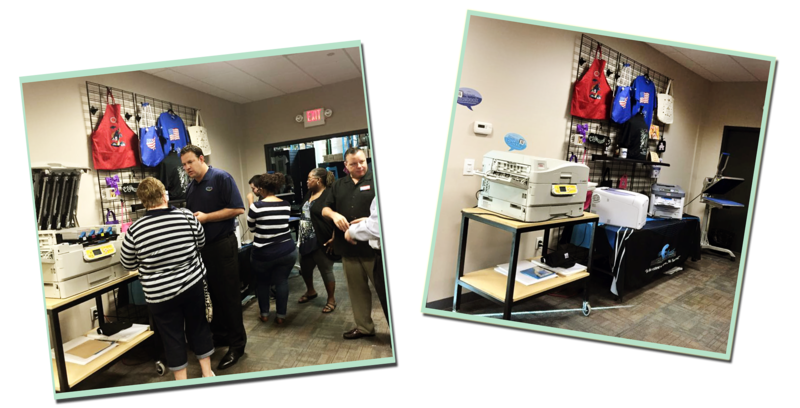 On September 25th, 2015 Coastal Business Supplies hosted a very successful Open House with a fabulous turnout of customers and tremendous support from our vendor partners. Those partners included Siser, Graphtec, HIX, OKI Data, Neenah Paper, Unisub and Chromaluxe, Vapor Apparel, FDC, EPSON, Hotronix and ACG Finance! Thank you so very much to everyone who attended! For those of you who were not able to attend the event, I wanted to give you a sense of what everyone was demonstrating and getting to see first hand. First off, sublimation mobile cases are still alive and kicking! It might not be the massive game changer it was, but people are still decking their Samsung and iPhone devices with custom phone cases. The truly interesting part to me was that people who have actually traditionally been desktop sublimators are now looking at the EPSON F-Series solutions to save money on ink and increase production. The Unisub SwitchCase Grip device covers were also very popular, as well as the line of Chromaluxe photo panels and the new natural Chromaluxe wood panels. 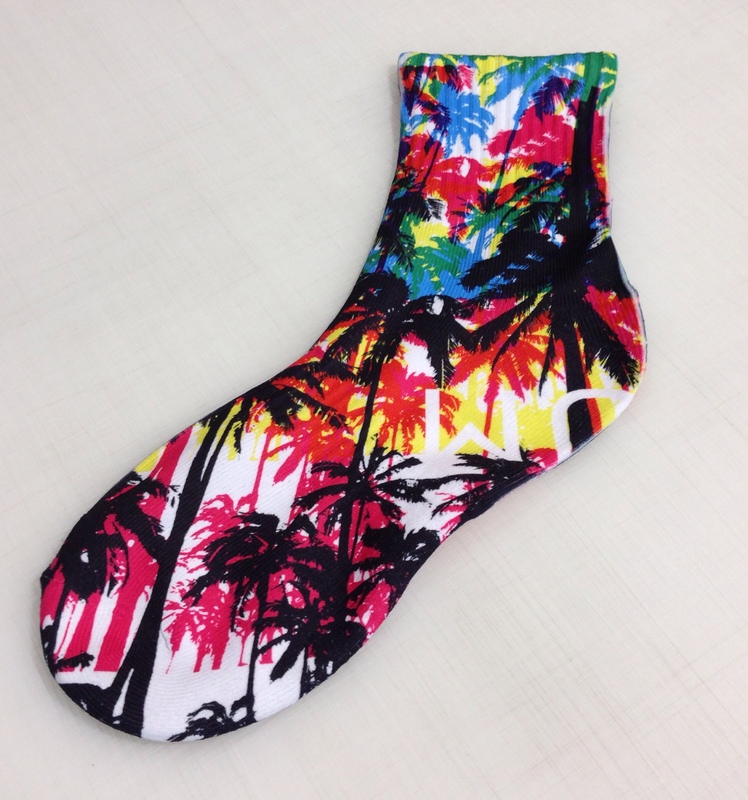 Fun and fashionable Vapor Apparel socks and sleeves were created at the event by customers, as well as a wide variety of sublimation shirts. Prints were created on-site with all-over transfers printed from the new Epson F6200 and pressed on the Geo Knight Maxi 44” press, and also smaller transfers created with the Sawgrass Virtuoso printers and pressed on the Hotronix Fusion. We could hardly keep up with the demand for the Vapor products! This was a great firsthand way to see how these transfer processes are done and helped solve some problems of customers’ initial experiences by seeing the help of the right heat press accessories put to use, especially the “hows” and “whens” to use these products. We also saw a huge amount of interest in the OKI Data heat transfer solutions, including both the CMYK C831TS and the white toner solutions. Those printers matched up with Neenah heat transfer papers to create beautiful self-weeding transfers onto garments as well as many hard surface items that can’t be sublimated. Using the Neenah Image Clip and Forever Laser Dark No Cut we were also able to show some of the foil capabilities from both the CMYK and White Toner printers as well for dazzling metallic finishing effects to add extra flare to products. 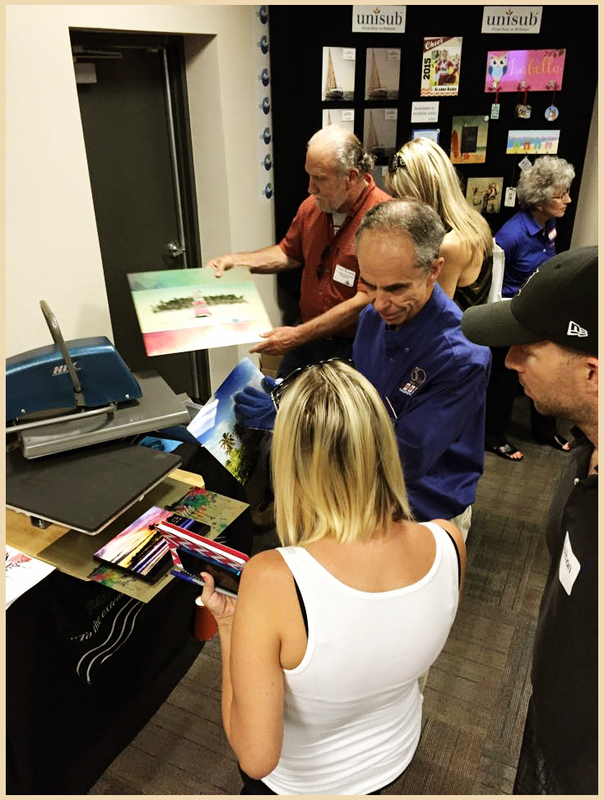 The vinyl cutting area was also a hot spot, packed with a wonderful display of the Graphtec cutters loaded up with numerous products, from Siser’s Easyweed to FDC’s sign vinyl and beyond! The Graphtec machines were cutting a wide variety of designs to show that heat transfer vinyl is not just for names and numbers, but really amazing for projects of all shapes and sizes! With FDC’s sign vinyl they were displaying that you can create amazing wall graphics, etched glass appeal and more. With the Graphtec’s ease of use, these cutters are the most technically sound cutters on the market which didn’t take long for customers to see during the mixing of vinyls that were loaded up and switched out throughout the day. Finally, folks were talking about the new Hix presses on display. The HIX 16×20 Swingman press was creating natural wood panels with sublimation transfers and they were turning out with amazing results. Fun fact: did you know Hix is American-made and manufactured?! They even had a 9×12 Hobby Lite in the HUGE variety of items that were up for give-away prizes! Beyond what I saw above, I reached out to the Coastal staff members and asked them what the most common interests and questions that customers had during this great Open House celebration..
Darci Jeffrey-Andersen – Professional Solutions Representative: There were lots of questions about the difference between direct-to-garment printing and sublimation, since direct-to-garment works best for cotton and dye-sublimation is a mostly polyester-based decorating method, but it’s not even limited to t-shirts or fabrics! Sarah Young – Marketing Coordinator: I spoke to a couple who orders currently orders transfers preprinted from a fullfilment company and only owned a heat press. They were looking to dive more into the custom gift business for family/friends only needs but weren’t sure exactly which route to take! In the end, they decided upon sublimation, since the ability to transfer to so many items without leaving a transfer feel was the big seller and they knew they would not be gifting something that would wash away or scratch off with washing! Another big sublimation question was in regards to do-it-yourself coatings – a lot of people don’t realize that “sublimation blanks” are premade FOR the sublimation process, so they’re specially and permanently coated to withstand the heat of the process and offer the most lasting, vivid colors possible! Do-it-yourself coatings are often too inconsistent and difficult to apply perfectly evenly for consistently quality results like a premade blank can offer. They were also looking into buying a vinyl cutter to cover their own transfer needs instead of ordering special transfers each time from companies that weren’t turning around as quickly as they were needing them for the cotton/dark colored fabric items. Also, there were quite a few people who didn’t realize you could add mixed media options like rhinestones and vinyl onto sublimation transfers – a big factor is that with sublimation the heat is around 375-400 degrees and with vinyl/rhinestones being a low temp setting the sublimation ink isn’t as likely to reactivate so while you still want to use a teflon to protect your platen when transferring the additional items to the fabric, it isn’t likely to have your sublimation that’s already been pressed to ghost or re-heat at that low time and temp setting. Jamie Wisdom – Customer Relations Representative: The most asked question I heard was what product do we sell the most – which has to be hands down the sublimation market, with the transfer papers and vinyls right behind. Sublimation offers so much full-color photo variety . There we also questions about our sublimation products, mainly how we are able to press them. (Plates and Mugs) I like the 3D vacuum press for the plates and either a mug press or a mug wrap for the mugs. Maradith Schwandner – Customer Relations Representative: Everyone was asking to see the laser prints, and some didn’t even notice the side-by-side difference with the direct-to-garment printed shirts! A lot of people are also immediately put off by the idea of printing onto polyester-only t-shirts with sublimation, but the minute that they felt a Vapor Apparel shirt they completely changed their minds! It was a great event in celebration with our 25th Anniversary as a company and we had a terrific time. We appreciate everyone who stopped by to see us, as well as our amazing vendor partners who supported us with staff, samples, and products all day long. We can’t wait until next year for even more fun! Stay tuned for even more photos of this exciting event below! OKI Data c831TS – Your new transfer printer and more! There is a new OKI Data c831TS Printer on the market, and it is something to talk about. This is the latest in the line of transfer printing devices from OKI Data, who is the only laser (LED) printer manufacture that embraces transfer printing. The laser (LED) printers in the US have never really caught on for transfer printing in the US Market until recently. Before OKI Data invested a significant amount of resources into our market most transfers were created on a inkjet printer, and I was one of those folks who said inkjet is the only way to go. So why the change of tune? The Benefits of Going WIDE! About 85% of sublimators are using a small format system and most likely doing pretty well. Small format is actually defined in the sublimation industry as any printer under 42” in width. So with all of those people using small format technology, why was I was excited to see the editorial calendar for the month of July? Wide Format Sublimation technology is one of those fields in our industry that has some misunderstandings that I would like to explore so we can all have a better sense of the benefits of this process. So, let’s discuss the economics of wide format sublimation and misconceptions to a few of the new markets that are opened up by adding wide format sublimation equipment to your company. More than likely, one of the most important factors sublimation companies need to consider is the economics of wide format sublimation. I know for a lot of people, including myself, as soon as the words “wide format” is tossed around, visions of hundreds of thousands of dollars being spent, huge warehouses and big business politics. Well, fortunately for those of us who have those over active imaginations, it really is not that bad. Typically, you can purchase a 44” printer system with all the inks, software and paper to get started for about $8,000 to $9,000. While knowing that it is a very healthy investment it is not one that is out of reach. Some other costs involved could be a large format heat press, but it needs to be noted that not all wide format printing needs a large format heat press. If you do need a large format heat press you can expect to spend between $10,000 to $20,000 depending on your needs. So now that investment could be up to $30,000 to fully get into wide format sublimation with a wide format heat press and that number probably makes you a bit more uncomfortable. A different way to make this type of large investment within reach might be to consider leasing the equipment. If your credit is pretty good on a standard 60 month term lease with a $1 buyout, you would need to come up with about $700 per month. 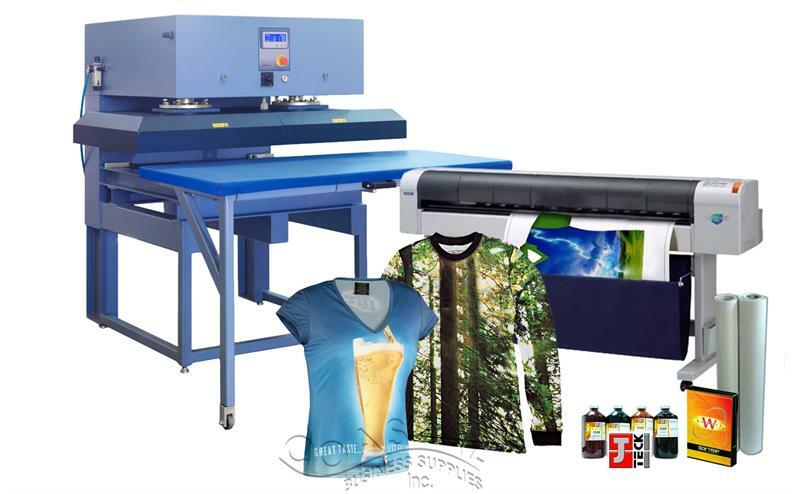 I won’t get too deep into the ROI calculation in this article, but many companies with this equipment have proved that making $7500 a month in profit with sublimation printing is well within reach. Epson Wide-Format Printers with Original Epson Sublimation Ink Are Also Possible Options! So, the actual outlay of cash is less than we probably anticipated, but what are the real reasons I feel so strongly about educating others about wide format sublimation? The finished goods costs will change substantially for the better. I have talked to some who took the plunge into the wide format arena who are producing items that are only 6” x 8” in size. They want the increased production capabilities and they are also going to drastically reduce the cost of ink and paper. Again, all it takes is a little bit breakdown of costs and you will find that things change pretty quickly. Let’s say you are a small format sublimator paying about $70 for a 30ml ink cartridge. That is about $2.30 per ml. A typical sublimation transfer uses about 1.5ml of ink per square foot, you have about $3.75 per square foot of ink and paper cost (assuming paper is about $.25 per square foot for paper cost). Now let’s compare that to large format sublimation where you are paying approximately $0.15 per ml of ink. So, your cost for paper and ink is now less than $0.50 per square foot. That is less than 2,500 square foot of sublimation transfer you would have to print to pay for the price of the wide format printer. Breaking those costs down even further, just about 1,900 sheets of 11 x 17 paper and you are already spending more on ink and paper compared to wide format and you could have paid for the printer. Socks can be printed & pressed with desktop size printers, but are MUCH easier and more profitable with wide format printing machine solutions! Also, we cannot forget to consider the improved production speed. The greatest part about sublimation and its digital capabilities is that you can produce many different images, sizes and type of product all at the same time with the printing portion. Then you can gang up the items on the heat press as long as they are the same thickness and type of product and your pressing cycle doesn’t have to go up. You are essentially reducing your production time by the number of items you can get under your heat press. Instead of 6 cell phone cases at a time with the smallest format printer, maybe about 20 or 30 under a 16 x 20 heat press. If you are making $10 per cell phone case than that becomes $300 per minute of production time versus $60 per minute. I think it is safe to say, more money can be made with a wide format printing system and the return on investment makes sense for a lot of sublimators. Another common misconception I have heard is that it is hard to use. While yes at first glance it can seem more difficult but the process is the same. The ugly word that gets used is RIP software, but really if you are working with the right ink manufacture and supplier the RIP software should be set-up on the front end and most of the major RIP brands actually have features that make using the wide format printer easier. With most wide format RIP programs, you should have the ability to drop your jobs into it and let it “nest” it for you to optimize your printing and paper usage. Most of them also have a job costing calculator to more accurately quote your work and some of them even have the ability to do variable data output which makes jersey creation and other creative markets even more appealing for you without a lot of manual work. Many people still think it is necessary to have a wide format heat press to properly use a wide format printer. As we briefly discussed earlier, this is simply not true. 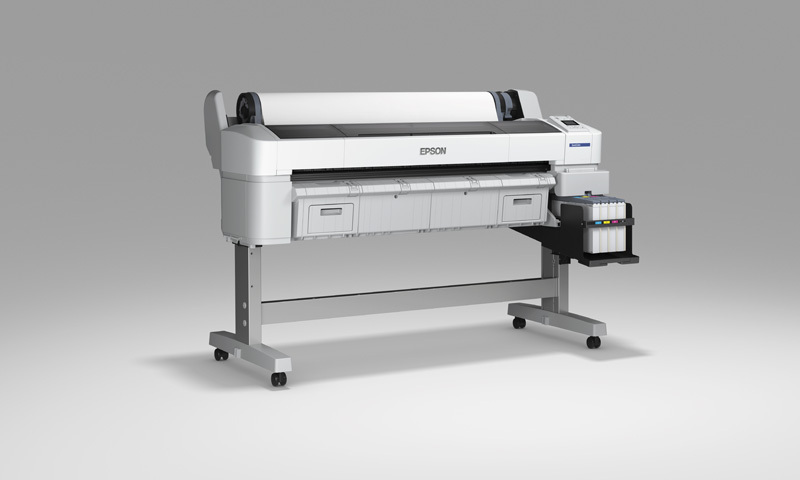 Many companies choose to go with the wide format printer only for the ability to increase their production and to reduce their costs dramatically. Also, numerous products can be created that can simulate a larger heat press with a smaller heat pressed just by pressing in multiple locations. The wide format printer will give you options to create larger designs to take advantage of your full 16 x 20′ heat platen size. One final misconception that I have heard before is wide format will not print as high quality as some of the small format printers on the market. While the initial setup can be trickier, using the correct ink manufacturer and supplier should eliminate any issues. If you were trying to create high-end photography reproduction, then yes you will need to find a system that has eight or more colors but with the current 4 color wide format systems in the marketplace today, the correct profile, ink and paper combination will allow you to create the same quality, if not better, than the current small format systems in the market today. Printing All-Over Sublimation Apparel is a Unique Niche market that you can make your brand known in! Finally let’s talk about some of the new markets this can potentially open up for you. The first big one to me goes back to our discussion at the beginning about how many small format sublimators are out there in the world today. With your newfound production speed, larger imprint capabilities and drastically reduced production costs now you can easily become a contract sublimator. This allows for plenty of profit margin for you and someone who would be reselling these items to the end user. This opens up a completely new market to you without all the marketing expense and other headaches that go along with dealing directly with the users at times. Wide format sublimation opens up new markets that are much larger than the limitations of a small format sublimation system. Even without a wide format heat press you, certainly can create a lot more in the smaller realm like socks and other smaller wearables such as infant and toddler onesies or youth sized all over or full print t-shirts and apparel. If you are able to make the bigger investment into a wide format heat press a huge realm of possibilities will be available to you. Outside of all of the reasons discussed about above, you can now create all over garment decorations, cut and sew pieces for a clean sublimation look for jerseys and other sports gear, blankets, throws and towels. Consider large size photo panels, commercial building decorations, scarves, neck ties and the possibility of creating some soft signage, flags and banners. Less expensive, faster production and new markets are some pretty good benefits when using wide format sublimation technology. I hope this breakdown of wide format sublimation will bring more positive thoughts to the sublimators out there and spark some interest in producing some new productions with this process.